Laser « Global Market Insights, Inc. The tremendous surge in the adoption of solar panels, thanks to government initiatives, will fuel solar panel recycling management market. The increase in the number of solar panel installations indicate an equal increase in the number of decommissioned panels, which in turn will drive the industry trends. 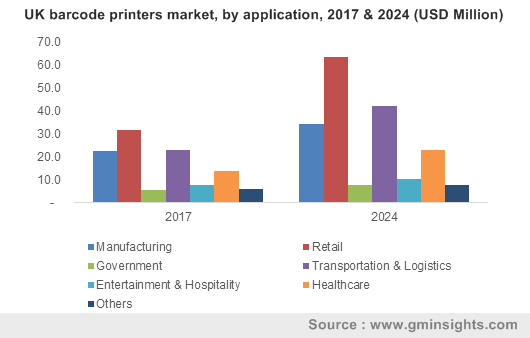 Most companies nowadays are also intent on establishing newer recycling facilities to encourage the green revolution, further stimulating solar panel recycling management market. For instance, recently, Veolia Environnement S.A., the French environmental solutions provider, announced its plan about implementing a new solar module recycling facility at Rousset, south of France, for recycling decommissioned solar modules. Solar panels can suffer normal losses or early losses. In case of the former, the panels function until the end of their shelf life, after which they are decommissioned, accumulated, and recycled. Solar panel recycling management market share from normal losses is expected to cross USD 300 million by 2024. When solar panels cease to function efficiently due to maintenance issues, technical problems, and unfavorable weather conditions, they are said to suffer early losses, in which case, they are decommissioned earlier than their usual shelf life and then recycled. Solar panel recycling management market from early losses is said to grow at a CAGR of 35% over 2016-2024. Global solar panel recycling management industry is slated to be fiercely competitive owing to the existence of several companies involved in the manufacture of solar panels and the increasing preference toward sustainable energy sources. Key players include Canadian Solar, PV Recycling, LLC, PV Recycling, LLC, Envaris, Reiling Glass Recycling, First Solar, Rinovasol, Silcontel, ECS Refining, Silcontel, Eiki Shoji Ltd, Chaoqiang Silicon Material, Cellnex Energy, REMA PV Systems, IG Solar Private, Darfon Electronics Corporation, and Suzhou Shangyunda Electronics. Companies engage in tactics such as product innovation and enhanced recycling procedures to sustain their position in solar panel recycling management market. Solar panels can be recycled by means of thermal, laser, and mechanical processes. The mechanical recycling process is deemed to be one of the safest, owing to which solar panel recycling management industry share from mechanical process will surpass USD 300 million by 2024. Solar panel recycling by thermal process places a strain on the environment due to the presence of excess silicon in the panels. 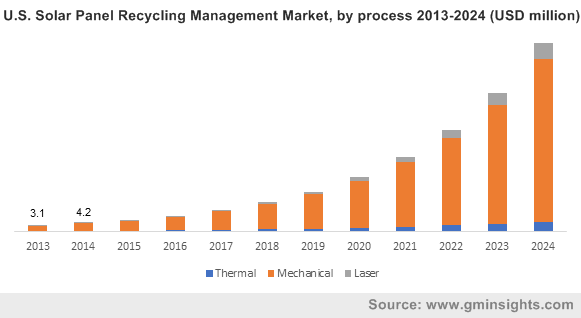 However, with companies striving to innovate environment-friendly thermal procedures, solar panel recycling management industry from thermal process, worth more than USD 1 million in 2015, will grow substantially over 2016-2024. Thin-film PV cells are extensively adopted for solar panels subject to their excellent quality and affordability, which will in turn, fuel thin film solar cells industry over 2016-2024. Increasing adoption rate of these cells coupled with their most favorable property of longer shelf life will also drive solar panel recycling management market from thin film PV cells, which is anticipated to witness a y-o-y growth rate of more than 40% over 2016-2024. Polycrystalline solar cells possess excellent properties such as high efficiency and enhanced battery power. High adoption of sustainable energy resources coupled with the aforementioned properties will fuel solar panel recycling management market from polycrystalline cells, which is slated to cross USD 220 million by 2024. In Germany, the number of dismantled panels amounted to more than 75,000 tons in 2015. An exponential rise in the number of decommissioned panels annually, strict government norms, and the establishment of solar farms will propel Germany solar panel recycling management market, which is expected to cross USD 24 million by 2024. Chile is anticipated to hold a volume of more than 45,000 tons of decommissioned solar panel waste, which makes it a lucrative market for panel recycling. Chile solar panel recycling management industry is expected to observe a CAGR of more than 40% over 2016-2024. High volume of decommissioned solar panels in the U.S. (30,000 tons in 2016) and rising adoption of solar panels will drive U.S. solar panel recycling management market size over the next seven years, which was worth more than USD 5 million in 2015. Solar energy is one of the most widely-adopted renewable energy sources globally. The increasing implementation of solar panels, government directives regarding waste disposal, and the increase in the number of decommissioned panels will significantly propel solar panel recycling management industry over the years to come. This entry was posted in Sustainable & Smart Technologies and tagged Early Loss, Laser, Mechanical, Monocrystalline, Normal Loss, Polycrystalline, Shelf Life, Solar Panel Recycling Management Market, Solar Panel Recycling Management Market Analysis, Solar Panel Recycling Management Market Forecast, Solar Panel Recycling Management Market Growth, Solar Panel Recycling Management Market Outlook, Solar Panel Recycling Management Market Size, Solar Panel Recycling Management Market Trends, Thermal, Thin Films PV Cells.